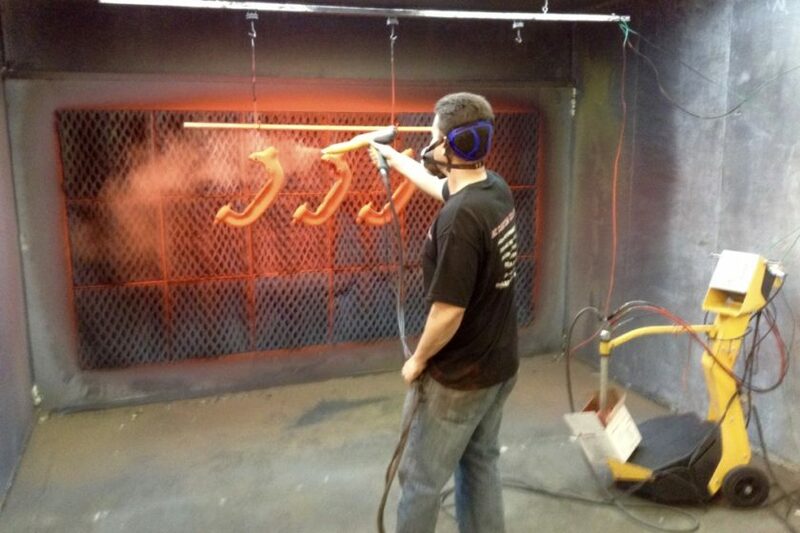 Powder coating is a popular finishing process that offers many benefits. Powder coating is the method of applying a dry powdered pigment blend to a part, then curing it with heat to bond the coating to the item being finished. Unlike wet painting methods, powder coating provides a durable, attractive finish with little waste and low impact on the environment. This corrosion- and fade-resistant finishing process can often be found in industrial applications, such as the final finishing step for automotive components, tools, and outdoor equipment. In this guide, the basics of applying a perfect powder coated finish will be introduced. The key to a perfect powder coated finish begins in preparation. Any debris, rust, scale, or grease on the part to be finished will impact the coat, resulting in unsightly blemishes if the part is not cleaned properly. A clean surface also ensures that the electrostatic charge applied to the item is not interrupted. Professional powder coating services use several cleaning methods, including media blasting or chemical dips to prepare the surfaces of the item for coating. Just as important as preparing the parts to be coated, the work area must also be clean. Dust and debris should be eliminated from the work area, including overspray from previous powder coating applications. Remember that the item to be finished has an electrostatic charge applied to it, and dust may adhere to the item if the work area isn’t clean enough. Air filtration systems can reduce overspray and dust accumulation. Many powder coaters – DIYers and professionals alike – may use some form of spray booth to ensure a clean, contaminant-free workspace. Many variables go into powder coating, including the type of parts being finished, the type of powder formulation used, and the equipment itself. Professional powder coating guns typically have adjustable settings, particularly in their air pressure and voltage settings. Air pressure should be adjusted until the powder forms an even cloud; this pressure typically ranges from 5-10 PSI. Voltage settings are crucial in getting a good coverage. Powder coating voltage is measured in kilovolts or KV. The higher the KV setting, the more powder will stick to the item being finished. Too high of a KV setting may result in back ionization, which results in unsightly dimples or defects in the finish. Second coats typically require lower voltages; initial coats may be in the 100 KV range, while second coats are often done at 20-30 KV. Some trial and error may be needed to get the settings right for a particular application. Once the equipment settings are dialed in, it is time to apply powdered pigments. The goal is to lay down an even coating, and this is done by starting the spray to one side of the part and following through until the part is coated – pros try to coat the part in one pass. An even distance from part to spray gun is also part of the process. Best results are achieved by keeping the gun 6-8 inches away from the part being coated. Once the part is coated, the item will take a trip through the curing oven to bond the powder to the part. This step has many variables, including curing temperature and time. The end result is a smooth, even finish that resists chipping, fading, and corrosion better than traditional wet painting methods.